Create wonderful family memories in this clean, smoke free, cute, and spacious lake house. Silver Lake is a 600 acre all-sports, extremely clean lake. This lake house sits on 66 ft. of private lake frontage. Pure Paradise features 3 bedrooms, 2 bathrooms, and a finished walkout lower level with a laundry room and washer & dryer. Two bedrooms on the main floor, one with a queen sized bed and the other with a full sized bed. The lower level bedroom has a queen and full sized beds. All bed linens are provided. The kitchen is fully furnished and includes a microwave, refrigerator, coffee maker, blender and stove oven. This house does not have central air conditioning but there are ceiling fans, pedestal & window fans to keep the house cool. Outdoor amenities include a sandy, private beach with a fire pit, and a private dock. There is a HUGE deck overlooking the lake. A public boat launch is just 2 miles away, as is a wonderful park and kids playground. Conveniently located just 7 miles from downtown Traverse City, Grand Traverse Bay, and 6 miles from Interlochen Center for the Arts. The house is right by the lake with great view. Jeff was very easy to work with and responsive. We didn’t realize the house doesn’t have AC (we either missed the info on the list or that detail is not there). Couple days while we were there the house was pretty hot in the evening and night even with all fans in the house running. Other than that, everything was great. Great Stay at Pure Paradise! We really enjoyed our stay at Pure Paradise! We went up for the weekend to enjoy the fall colors. The owner has thought of everything to make your stay enjoyable. The bed was really comfortable, and the bedding on all the beds looked new. Although the weather was rainy, we could see how much fun it would be to stay here in the summer! There is a paver patio with a picnic table coming out from the lower level. There is a deck that has a patio table and porch swing off the main floor. Another small porch with yet another umbrella table! Lots of space to relax and enjoy the beautiful beach and Silver Lake. The kitchen was well stocked. We would definitely return. Silver Lake is a beautiful lake near Traverse City. Can't go wrong! Nice place to stay. Clean, Comfortable, Relaxing. Our stay was with six adults and we all enjoyed the place. The setting was really nice. Despite the fall weather we managed to spend some time on the wonderful lakeside deck. For us, the weekend really wasn't about staying at a lake, it was about enjoying the Traverse city area. The location was perfect for that. (Old Mission Peninsula is now minus more than a few bottles of great wine from several vineyards.) The drive from the house to Traverse City was short. There were a lot of people sightseeing and wine tasting like we were. Going back to the quiet lake setting in the evening was wonderful. Having cable TV available was nice and there were 3 TVs. Our interest was college football and we could all watch the game in the living room. (GO ND!) The bedrooms and beds were ok too, and are as seen in the pictures. Working with the owner was a good experience. Great communication. He did a nice thing and relaxed the check in and out times because he didn't need the quick changeovers for other guests. This was very much appreciated. There is a grocery store very close and several places to eat. Although we only were there two nights, I would highly recommend staying here in the summer. It has a great sandy shoreline and kids would love it. I loved this house. It was perfect for our couples weekend. My only suggestion is to bring your own pillows. Amenities were just as described. House was clean and well kept. I would highly recommend. We had a great weekend at the lake house celebrating our friends 50th birthday!! It was a nice location close to Traverse City and the owner was very good to work with. The coffee pot was very slow at brewing so I sent him a message just to inform him of the situation and with in a hour we had a new one!! I highly recommend staying here!! The beds were very comfy!! I find that very important!! I can't say enough about this beautiful home! It was 10 minutes from downtown, and just the quiet tranquility we needed for a relaxing weekend. The photos don't do it justice, it is much larger than the photos led me to believe. The owner was very responsive, and helpful. We will be back in the future!! 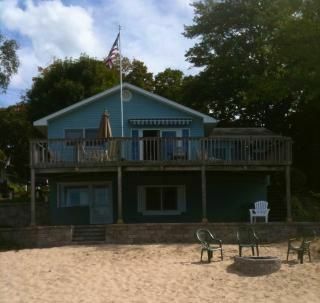 This property is located just 4 miles from the shopping and fun that Traverse City has to offer. Great location to take in the National Cherry Festival or Traverse City Film Festival. Interlochen Center for the Arts is just 10 minutes away. The Sleeping Bear Dunes National Lakeshore Park is 30 minutes away. Walk to see our baseball team, the Traverse City Beach Bums play a fun game of minor league baseball. Spectacular fireworks display after every Friday home game visible from Silver Lake.